Add snap peas to a 3 quart saucepan of boiling water and cook for 30 seconds or just until peas turn bright green; drain and plunge into cold water to stop cooking; drain. 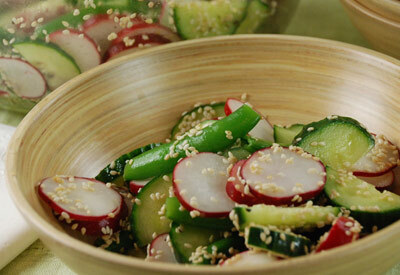 Toss peas, radishes, cucumber and sesame seeds with vinegar and oil. Season to taste with salt and pepper.